Plate Tectonics is an old creationist theory that was originally rejected by secular geologists. Recently it has been hi-jacked by evolutionists, and is now part of their mantra. According to the theory, the continents were once joined together, but have moved apart. 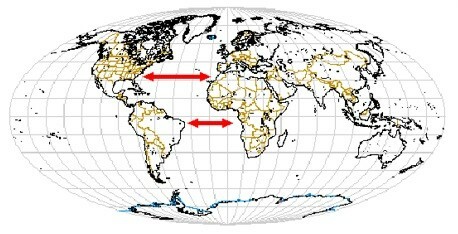 That’s why the North and South American coastlines look like they fit with Europe and Africa. They describe the theory, using an illustration that involves broken egg shells moving on a hard-boiled egg. Earth plates move in a similar manner [to broken egg shells moving on a hard-boiled egg], and as a result they can move very long distances. Notice that so far we have referred only to the motion of plates on the Earth rather than to the motion of continents. This is the critical difference between modern plate tectonics and Wegener's continental drift. The plates may contain continents, or ocean floor, or both. Their facts are basically correct. The surface of the Earth is made up of broken plates which have moved great distances. The edges of the plates are very well marked by geologic activity (earthquakes and volcanoes). The geology textbooks are absolutely right. There are plates, and they are moving today. What they generally fail to tell the students is that this “new” idea has been around for centuries. Regardless of whether or not one believes the Bible is inspired, one must admit that Genesis is an ancient historical document translated into Greek in 331 B.C. This ancient document advances the theory that at one time all the water was gathered in one place, leaving all the land together in one super-continent (Genesis 1:9), and that the land was subsequently broken apart (Genesis 10:25). So, there were people who believed in plate tectonics for more than 22 centuries before Wegener wrote his book. Not only that, another book that beat Wegener to the punch by 57 years. Plate Tectonics is not a “new” idea. Furthermore, we think it is unforgivable that in the academic world, where so much importance is usually placed on who had the idea first, Wegener is given credit for an idea that was so well established so long before he was born. Antonio Snider-Pellegrini’s work might have been obscure, but how can one argue that Genesis was an obscure document that few people had ever read before 1915? The three differences between modern theory of Plate Tectonics and the ancient theory of the division of land during the time of Peleg are (1) how it happened, (2) when it happened, and (3) how long it took to happen. The real difference in the two theories has to do with speed. According to the Plate Tectonic theory, the plates have been moving slowly for a long period of time. As continents slowly press against each other, they build mountains. Here we see two continents in the act of colliding. India, in its long northward trek from its original home near Madagascar, has rammed into the underbelly of Asia, and the result is the highest mountain range on Earth. Much the same is happening in the Alps, where the northern motion of Africa is forcing Italy against the European continent. Let’s consider the “automobiles in collision” analogy. Suppose a police officer comes upon the scene of an automobile accident. A car has smashed into a tree so recently that steam is still coming out of the radiator, and one of the wheels is still slowly turning. In fact, the officer notes that it takes 10 seconds for the wheel to make one complete revolution. Since the diameter of the tire is 24 inches, the circumference of the tire is 6.28 feet. A point on the tread moves 6.28 feet in 10 seconds, which is about 0.4 miles per hour. The officer therefore concludes that the car was going 0.4 miles per hour when it struck the tree. Since the left fender is pushed back about 3 feet, it must have taken almost 5 seconds for the car to collide with the tree at 0.4 mph. The error in this reasoning, of course, is the idea that “the present is the key to the past.” You can’t judge how fast the wheels were turning just before the car hit the tree by measuring how fast they are turning now. But uniformitarian geologists believe that the rate of geologic processes remain generally constant over time (whenever it suits their purposes). Therefore they conclude that the speed at which the plates are moving today has been the same for millions of years. They think that mountains were created by very slow collisions over millions of years, just like our fictitious police officer thought the car struck the tree at 0.4 miles per hour for 5 seconds. On August 13, 2000, I made my fourth successful hike all the way to the top of Mt. Whitney. (Let’s not talk about the numerous unsuccessful ones.) I left the Whitney Portals parking lot at 4:48:35 AM (8,261 feet above sea level). After hiking more than 11 miles to the summit, I finally reached the top (14,494 feet) at 1:22:07 PM. After a 23 minute rest at the top, I headed down and got back to the car at 7:58:59 PM. I tell you this to let you know that I have recently been “up-close and personal” with a very tall mountain for more than 15 hours. Here is what I saw looking northwest from Trail Crest (36o 33’ 34” North, 118o 17’ 30” West, 13,615 feet). Some of those slopes are almost vertical for thousands of feet. Were they really produced by a 2 inch per year collision with the Pacific Plate moved by convection? We don’t think so. What we see here is evidence of a high-speed collision. The North American Plate hit the Pacific Plate very fast and very hard. The motion we observe now is just the aftermath of that collision. Two studies 8 9 appeared earlier this year in the journal Science showing that various places in California, Nevada, and Utah, are moving at different rates, in different directions. Speeds range from 1 to 15 mm/year at directions from 270 degrees (due West) to 340 degrees (nearly North). These places could not have been moving at these speeds and directions for millions of years. If they had, then the land would have been ripped apart. These motions are the result of the land settling, and relieving stress that built up during a previous collision. The abstracts of two articles in Science use lots of impressive phrases. They talk about a “vertically averaged deviatoric stress tensor field”, “gravitational potential energy differences”, “fault-normal compression”, “plate interaction stresses”, and “internal deformation”. What they are saying is that the western United States has really been crunched together, and is slowly moving in such a way as to relieve some of the stress. We believe that the slow motion of plates and landmarks we observe today, and the earthquakes we experience, are simply a residual effect of the tremendous force that ripped continents apart, and smashed them together to form mountains. 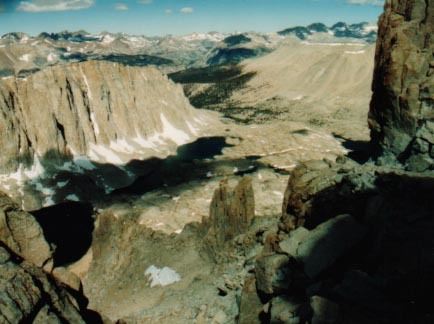 The collision was fast enough to build Mount Whitney almost instantly, and produced stresses and gravitational imbalances that are still being relieved today. The small movements we measure today did not form the mountains over millions of years. As it says on the cereal box, “Some settling will occur.” That's all that's happening today.